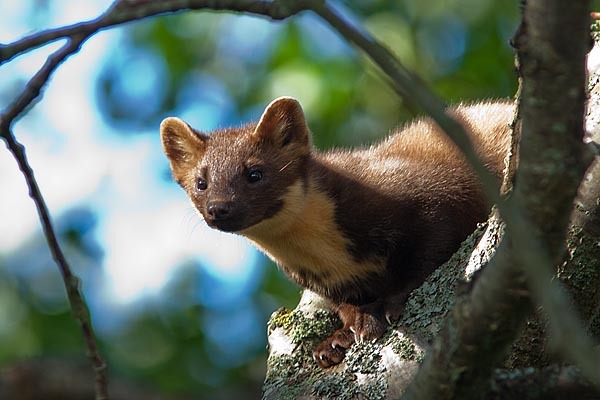 A hundred years ago pine martens were not numerous in Estonia; with time the little animal was encountered more often, at first near farmhouses conveniently sited at forest verges. Of course it caused trouble when they visited the farm yard to prey on domestic birds or even rabbits in their cages. In recent decades pine martens have also begun to inhabit garden cities and tree stands in communities, but these stands of trees or larger parks must somehow be connected with a nearby forest. No wonder - many other animal species have moved into the cities. A suitable habitat is preferably one with a dense undergrowth of trees that offers good hiding opportunities. The pine marten has a brown fur, and a yellow or orange patch on the throat and neck that can reach to the forepaws, but this patch varies very much with the individuals. The fur on the belly is lighter. The young animals have just left the maternal care and begin to become independent, searching for a suitable living place – which is why they are more visible in autumn.